Note: At the end of this blog are links to all the Spare Parts referred to throughout the Blog for ease of reviewing / purchasing. Most likely that you need to replace the O Rings. Valve may need replacing. 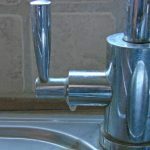 Here is our Guide How to remove the Handle on your Kitchen Tap. If the valve bush comes out with the valve, order a new set of valve and valve-bush. remember new valves can take a few days for the rubber washer to “be bed down”. Tighten the valve manually and only use a wrench for the last quarter turn so as not to damage the seals on the Valve. 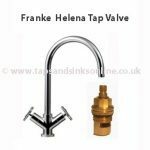 If leak continues after tightening please contact us on sales@tapsandsinksonline.co.uk. Hot and Cold valves are NOT interchangeable. A Hot Valve opens Clockwise. A Cold Valve opens Anti-Clockwise. 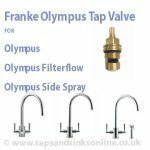 If you have the Franke Filterflow Olympus Tap then the same Cold Valve is used in both the Cold ‘mains’ and Cold ‘filtered’. 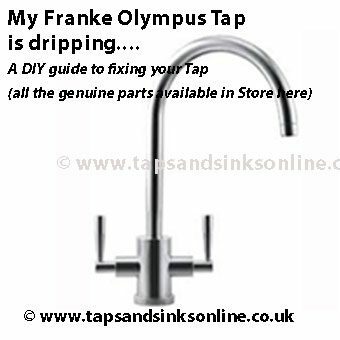 Tip: Franke Olympus Filterflow :If your water is dripping from the Cold side and you don’t know whether it is the Cold Mains valve or the Cold Filter Valve that needs replacing, try the replacement valve in one of the cold sides and if drip continues switch. If drip still continues then you either need 2 Cold valves i.e. both need replacing, or the drip is on the Hot Water side. 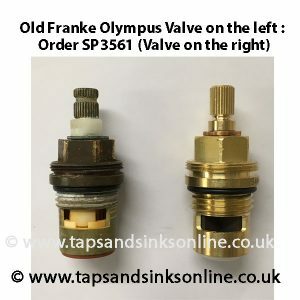 We only stock the Franke Olympus Tap spare parts ‘currently’ being used in the manufacture of the Franke Olympus Tap, Franke Olympus Filterflow Tap ,Franke Olympus Side Spray and Franke Specialist Spring Tap as per the current technical specifications (1427R/3561R). * all ‘mm’ measurements are rounded to the nearest mm. There are two sets of threads, one above the Black Rubber O Ring and one set below. If your valve appears to be wider than ours but all measurements tally except diameter, just make sure that you have removed the brass bush. 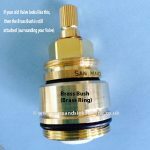 For more information on removing the brass bush, see here. There have been 3 different Franke Olympus Brass Bush. We stock two of them. We do not stock the very earliest one (thin lip / ridge at the bottom) in which case , all that we can recommend is that you try to separate in order to re-use. 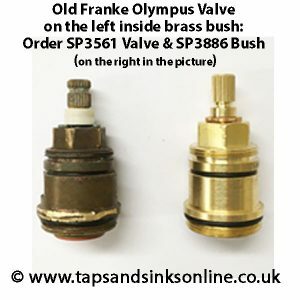 Here is close up detail of the old Franke Olympus Valve inside this Bush that we do NOT stock. 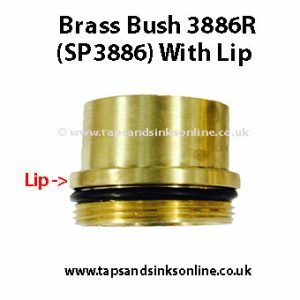 Old Brass Bush (with lip) . 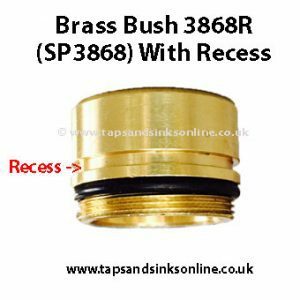 Can be used with the New Valve but the Brass Bush 3868R is not suitable if your Tap has the old brass bush style. 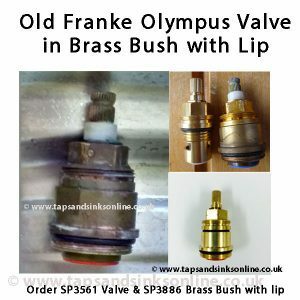 See here for all our Franke Olympus Spare Parts (Valves, Brass Bush, O Rings, Handles, Spouts and Aerator). 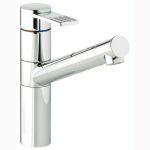 For common Kitchen Tap problems, see our Kitchen Taps Troubleshooting Guide here. Our Blog / Plumbing Guides section includes tips e.g. how to remove a valve. Follow the links below. continued ones) will fit my taps. Otherwise my tap is still working perfectly. Dear Anne, the parts you require are the same (just a different code name, as this same valve has also been coded 3561R on some installation guides). The instructions we post are for someone handy at DIY. If in doubt we always recommend calling a plumber. 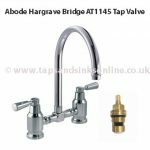 The advantage to having procured the spare parts in advance of a plumbers visit is that they can fix the tap for you rather than recommending purchasing a new tap when all your existing tap might require is the replacement of some spare parts. 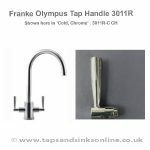 how do I replace the O rings on a Franke Olympus kitchen tap? 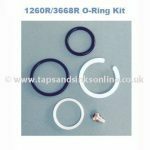 You will find the Franke Olympus O Ring Kit that you need here: Franke Olympus O Ring Kit. Earlier models take a different grub screw so we would recommend that you retain (carefully remove your existing one as they are very small) in case it is a different size than the one currently supplied by the Manufacturer. Not sure exactly what you mean. 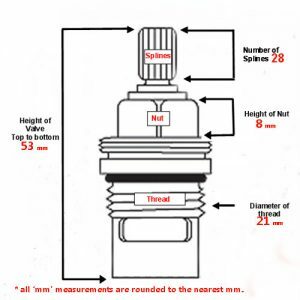 Do you have the correct size Allen Key – the grub screw changed in size so you jsut need to get an Allen Key that fits your screw. 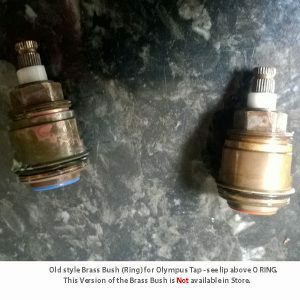 HI Veronica, usually if your tap is dripping from the spout you would need to replace the valve and here is the link to the Mythos Valve (Buy the earlier version 2307R and if calling a plumber you could buy the brass bushes as well and return if not needed). The bathroom situation seems to be some how water pressure related. Update – I can undo the valve cover but obviously cannot take it off as the handle is still there. Could the lime scale inside be preventing the handle coming off? If so I can see how I will get rid of the lime scale as it is “inside” the handle. I have a Franke Olympus, along with a spray attachment. The tap is dripping from the spout, and getting progressively worse. It was installed in 2012. How do I know whether I need to replace a valve, and which one it is? Usually if a tap is dripping from the spout, the valve is the issue. This blog might assist you in identifying which one is dripping. How to tell which Valve is dripping, hot or cold?